Bali's most lively and storied village is welcoming the world's most neighbourhood-centric brand in July 2017, with the opening of Hotel Indigo Bali Seminyak Beach. In a village that captures the ancient and modern zeitgeist of Bali in all its colour, energy and lively tradition, curious travellers are the new savvy individualists. As a destination, Bali has always delighted guests with its ability to embrace the modern and traditional with a stylish and youthful zest — and nowhere is this more apparent than in Seminyak, a neighbourhood where the ocean breeze blends a fusion of village gamelan and modern house music. And indeed where in every direction, the visitor can trace the neighbourhood's story of a Cultural Journey — exploring its local communities and temples, where ceremonies and craft work retain the same daily rituals that connect you back to the heritage of the 15th century. The new 289-room hotel gracing Seminyak's Mesari Beach draws inspiration from the flavours, culture and character of its surrounding local neighbourhood, the vibrant and lively Seminyak district — and Hotel Indigo Bali Seminyak Beach promises an authentic fusion of enchanting Balinese culture and contemporary creativity. Extending across 4.7 hectares of lush, landscaped grounds, including exotic plantings and beautiful vertical gardens, the resort fronts the southern stretch of Seminyak. Here, the best of modern and traditional Balinese design are seamlessly integrated, reflecting the surrounding Seminyak neighbourhood, from its fashion boutiques and world-famous restaurants to its artisanal craftsmanship and architecture. The 270 spacious rooms and suites are stylishly appointed with a striking mix of locally influenced design touches. 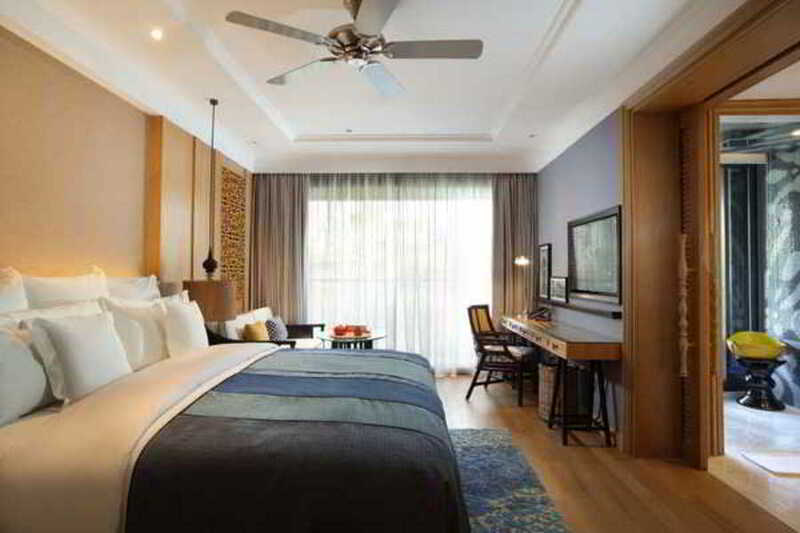 Every guestroom is fitted with daybeds, plush bedding, spa-inspired bathrooms and state-of-the-art features. In addition, there are 19 villas with private outdoor swimming pools, whirlpools and marble bathrooms – all inspired by the Tri Hita Karana philosophy (one's relationship with Gods, living beings and the earth), and showcasing a clever juxtaposition of contemporary design and ancient tradition. Each villa is planned like a Balinese house, consisting of three main areas: Nista Mandala, a space for residents to embrace the Gods; Madya Mandala, a space to be at one with nature; and Utama Mandala a space for interpersonal relations. Welcoming guests at Hotel Indigo is the expansive lobby space, dubbed the Neighbourhood Gallery. A Balinese Subak-inspired wall structure, accents of verdant foliage, unique outdoor artworks by local artists and water fountains symbolise the tranquillity of Seminyak and impart a soothing arrival experience. Signature geometric lines that decorate the resort at entrances and on canopies and walls are the creative interpretation of the traditional Balinese weaving textile, Tenun Songket. There are seven lifestyle dining offerings at Hotel Indigo, with a destination to suit every moment and temptation of the day or night, all helmed by the resort's Executive Chef Mads Wolff. Makase is the hotel's neighbourhood café, contemporary yet casual with an open kitchen serving colourful local flavours for breakfast and dinner. Pottery Café is open all day with a finely curated collection of local specialty coffees, teas and chocolates, alongside freshly-made pastries. It is also set as one of a kind outlets with its own coffee roasting machine and Pottery-making workshop by local ceramic artisan. Organic artisan bar by day and speakeasy cocktail bar by night, the Tree Bar offers healthy and bespoke refreshments within a gorgeously verdant space. By the resort's main pool is the Cave Pool Lounge, which serves cool drinks, scrumptious light bites and refreshing sweet treats such as rolled ice cream and fresh sugarcane juice. Salon Bali is the signature dining restaurant of Hotel Indigo, an intimate space with a rustic design aesthetic where refined Balinese cuisine featuring the island's traditional delicacy – babi guling, or suckling pig – is served as part of an 8- or 12-course menu. Located beside the pristine white sand beach is SugarSand set to become Seminyak's hottest new beachfront bar and restaurant in Q4 this year with space for more than 400 beach enthusiasts. Leisure facilities for guests range from local cultural explorations to body and mind wellness. The resort's Sava Spa offers treatments and traditional Balinese massages using Sava Spa's locally-sourced natural spa products with active ingredients. The Spa also features 10 treatment rooms, a Relaxation Lounge, a Reflexology Lounge, a Nail Beauty Lounge and a 24-hour Health Club with wellness programs and state of the art fitness equipment such as yoga space, power stretching, weight-lifting, martial arts and TRX. Guests booking 'Resort's Opening Experience' offer on our website will enjoy extra savings up to 20% for stays starting from 16 July 2017 onwards. Relax in tranquil surrounding within the resort grounds for a minimum of two nights stay. This special offer is inclusive of daily breakfast for two persons and valid for limited-time only until 30 September 2017. About Hotel Indigo: The Hotel Indigo brand is a global boutique hotel brand that delivers a refreshing and inviting guest experience that is truly reflective of the local community. From the locally-inspired murals to the renewal program where the music, scent, and menu items change throughout the year, each Hotel Indigo hotel delivers a vibrant, engaging and genuine boutique experience that gives guests the confidence to step out and explore the local neighbourhood. Each Hotel Indigo property is unique and designed to reflect the local culture, character and geography of the surrounding area while brand hallmarks ensure consistent and reliable service from location to location. No two hotels are the same. There are 70 Hotel Indigo hotels open around the globe. With a quality global pipeline of 63 hotels, the Hotel Indigo estate is set to double in size to over 130 properties within the next three to five years. For more information or to make a reservation, visit http://www.hotelindigo.com. Find us on Twitter http://www.twitter.com/hotelindigo.